It’s FEMA National Preparedness Month: Does Your Emergency Plan Make the Grade? That’s National Preparedness Month’s (NPM) call to action, urging everyone in workplaces, communities, and homes across the country to prepare for emergencies such as natural disasters, illness epidemics, and human-caused hazards so that we can keep ourselves and others safe when they happen. 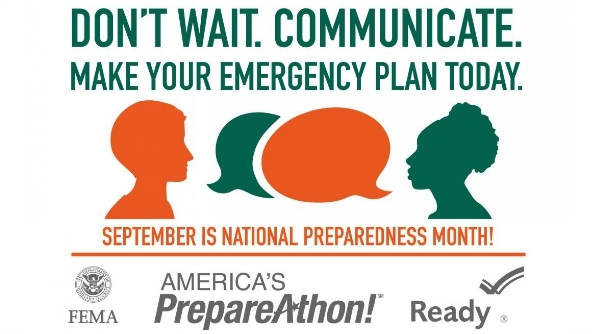 NPM is sponsored annually by the Federal Emergency Management Agency (FEMA) and observed throughout September, culminating in National PrepareAthon! Day on September 30. When it comes to the workplace, according to FEMA’s “Preparedness in America” report, businesses that encourage emergency planning have a significant impact on the safety decisions their employees make. In fact, “People who were encouraged by their employer to have a plan or participate in training were 76 percent and 86 percent more likely to do so, respectively,” the report says. And having a solid emergency plan in place is essential not only for workers, but also for the businesses themselves, considering that FEMA survey data shows that up to 40 percent of businesses affected by a natural or human-caused disasters never reopen following the event. When businesses do take steps to prepare, it can pay off in a major way. FEMA’s ready.gov site presents a number of case studies detailing how companies’ dedication to preparedness improved employee safety. One example focuses on Morgan Stanley’s offices in the World Trade Center: When a terrorist bombing struck the building in 1993, it took the company four hours to evacuate its employees. After that, Morgan Stanley bolstered its emergency planning program, and during the September 11, 2001 attacks, employee evacuation took only 45 minutes. Program Management: Identify regulations that establish requirements, and develop and administer your program. Planning: Assess risks, conduct a business impact analysis, and examine ways to prevent hazards and reduce risks. Implementation: Write a preparedness plan that addresses areas such as emergency response, incident management, and training. Testing and Exercises: Test and evaluate the plan by defining and conducting exercises to gauge effectiveness. Program Improvement: Identify when the program needs to be reviewed, discover methods to evaluate it, and use the review to make necessary improvements. FEMA offers several NPM resources to help promote preparedness both in and out of the workplace, including a social media toolkit, posters, and videos available here. Similar materials specific to NPM’s PreparAthon! are also available. For companies that deal with hazardous chemicals, NPM is the perfect time to review chemical inventories and leverage a chemical management solutions provider to ensure your employees have access to accurate, up-to-date safety information in the event of an emergency. Recent chemical disasters that have made headlines – such as the massive plant explosion in Tianjin, China and the release of millions of gallons of hazardous chemicals into Colorado’s Animas River – serve as glaring reminders of just how quickly disaster can happen and how critical it is to be prepared. MSDSonline offers a range of products and services to assist you in your emergency planning and preparedness efforts, including Workplace Training courses, and hazardous chemical inventory management solutions, complete with Tier II reporting features, chemical container mapping, a new Plan1 first responder chemical inventory sharing service, and other tools to assist with emergency response and preparedness. To learn more, contact an MSDSonline Representative at 1.888.362.2007. EH&S Blog Health & Safety It’s FEMA National Preparedness Month: Does Your Emergency Plan Make the Grade?